It’s amazing how much easier it can be to style your hair when you have the right tools. For most of us, the most widely used tool when it comes to our hair is the brush. Because all brushes are not created equal, I want to break down the basics and brush up your styling tool expertise. I’ll cover the different types, what they’re designed to do best, and where to get them. Flat or Round – Columbus learned the hard way, but you don’t have to. From a general stand point, there are 2 types of brushes: flat or round. Flat brushes are designed to smooth the hair with minimal volume or fullness. Round brushes do just the opposite; they can be used to make hair bigger and add fullness and movement. First, let’s break down flat brushes. Vent Brush–Vent brushes are literally vented, or have spaces between the bristles for air to flow. The bristles/teeth are usually a thick stiff nylon or plastic. 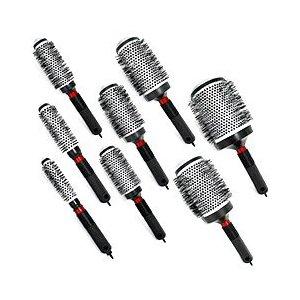 This brush is designed to allow hair to dry quickly when partnered with a blow dryer. The teeth of the brush are spaced pretty far apart. But because of its design, the user has very little control over a polished finish and the end result may be fuzzy. In order to refine the finish of your hair, the next step would be to use a curling/flat iron or a round brush. Best Use: A vent brush is the perfect choice for anyone with short to shoulder length hair who needs a quick rough blow-dry. Denman Brush–Denman is actually a brand name, like Kleenex is to tissue. The Denman brand, a London-based company, actually produces many different types of brushes. From a professional standpoint, if a stylist refers to a “denman” we are referencing a flat brush, without air vents. The nylon teeth are close together and secured in a rubber mat base. Note, there are many companies that produce this Denman style of brushes. In the salon it is one of my favorite brushes. Because the teeth are close together it creates more tension than a vent brush, and the rubber mat helps to eliminate static and frizz. I can get much more control and a more polished finish with this brush. Best Use: This brush is perfect for anyone with short to shoulder length hair wanting a smooth straight end result with little volume. 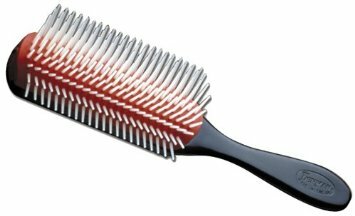 Paddle Brush–A paddle brush is somewhat similar to a denman in that it has many teeth close together to provide tension for drying and smoothing the hair. The difference is that the base is much wider than a denman and the teeth are more flexible. The wide base gives more exposure to the dryer for longer lengths and the flexible teeth help gently work through the hair reducing breakage. 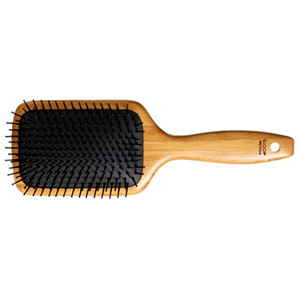 Best Use: The paddle brush is a great choice for anyone with long hair. 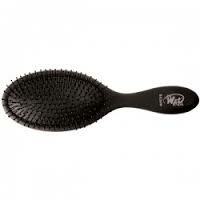 The paddle brush can give a head start on pulling out wave and curl to then be followed up with a round brush or iron. I love it for smoothing out my own hair. To see it how it’s used, check out the video “Quick DIY Blow Out”. 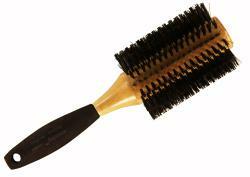 Oval Cushion Brush–This is another brush that is a classic and used by professional hairstylists regularly. A rubber cushioned base with nylon or boar bristle or the best is a blend of both. It is typically used on dry hair for perfect smoothing. Great for getting every last hair in place for your ponytail or special occasion hair. 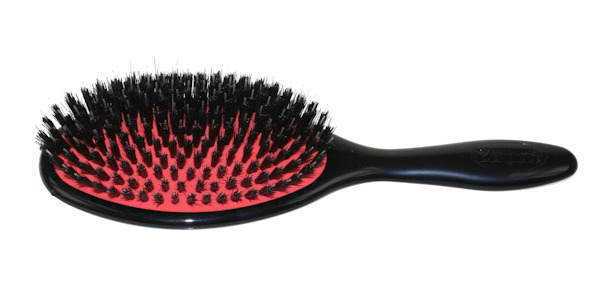 The cushion brush can also be used as a detangler on dry hair. Best Use: This brush is the best choice for smoothing and detangling any length of hair. Wet Brush – While not considered a classic style of brush, I am seeing more and more of this style on the market and it is quickly becoming a must have in my brush collection. Wet Brush is a brand that makes an oval flat brush with very flexible nylon teeth. It is the ultimate detangling brush on wet hair. The flexible teeth causes it to go through the hair and gently work through knots without damaging or breaking the hair. Other manufacturers are producing their own version of this style, so keep an eye out for it. Best Use: A Wet Brush is ideal for any hair length, but it’s particularly effective for longer lengths. It is best used on wet hair for detangling, but can also be used on dry hair. This is my number one recommendation for any parent who has a child with a sensitive head. It will save many tears and make your morning routine that much easier. Round Brushes come in various dimensions and materials depending on their use. Compared to a flat brush they are able to create more volume at the base or scalp and deliver soft rounded shape and movement. 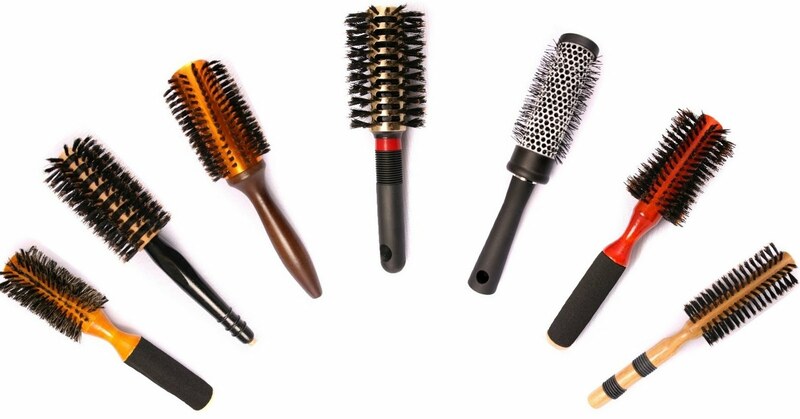 Metal/Ceramic Round Brushes–Because heat causes a more effective change to the hair, the base of these brushes are designed to heat up. The bristles are usually nylon and distributed further apart than a boar bristle round brush. When used correctly, they can mimic the effect of a curling iron to a certain extent. Best Use: Perfect for creating a smooth rounded finish on almost any length of hair. Your length of hair will determine the diameter of round brush you use. The shorter the hair, the smaller the diameter. The smaller the diameter, the more curl or bend you will get in the hair. The larger the diameter, the more fullness and “c” shaping. 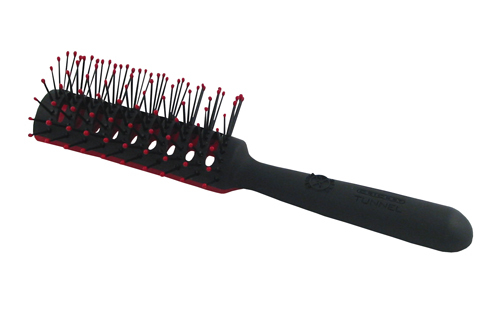 Boar Bristle Round Brush–As you can probably guess, a boar bristle brush uses actual boar hair for the bristles. The bristles are packed tight to create tons of tension and to coax every cuticle to lay down for the ultimate smooth and shiny finish. Boar bristle brushes get better over time. After continued use and exposure to heat, the ends of the bristles start to pop open a bit, much like split ends. The effect gives even more polish to the hair. This brush can be difficult for a hair novice. Because the bristles create so much tension, it can be difficult to work through your hair. It takes some practice to use this type of brush, but the results can be amazingly rewarding. Best Use: Boar Bristle Round Brushes are perfect for almost any length of hair. Choose the diameter based on your length and desired end result. You will also find boar bristle brushes with a blend of nylon bristles mixed in. This version will be a little easier to use on yourself. Final note about the difference between boar bristle and ceramic/metal round brushes. Boar will give you ultimate shine and polish with a looser curl or wave. A metal/ceramic brush will give strong shaping and volume and a little less shine. SamVilla.com – I work with Sam and use his professional tools daily. Some of my favorite brushes! Great paddle, denman style, and boar bristle brushes. Amazing quality and I love the heart of this company. See website for your nearest retailer. Denmanbrushus.com – U.S. website for all Denman brand brushes. If it’s mentioned above, you will find it on this site. thewetbrush.com – Home for the up and coming Wet Brush. The tender heads in your home will thank you. Cricket – My preferred ceramic/metal round brush brand. This link will take you to Amazon, the easiest way to shop for this family of brushes. yourtearsheets.com – Another company owned by fellow Redken Artist and Editorial Stylist, Giovanni Guintoli. Beautiful professional quality brushes. Give me your feedback! Questions about brushes or shopping for them? I’m happy to help. Questions about buying other hair tools? Check out Hair Dryers 101 for the inside scoop! Now go brush your hair.